It's been revealed. 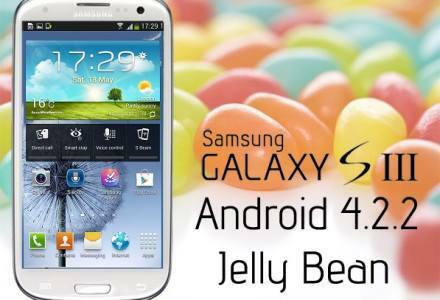 Just as promised, Android Jelly Bean 4.2.2 comes for Samsung Galaxy S III with many of the features already present at Samsung Galaxy S IV. Samsung seems to care about updating their older mobile devices with newer System Updates. The update for Jelly Bean 4.2.2 will likely come in either July or August. I guess many are excited and are impatient for the release of the update. Thanks to SamMobile we already can download the pre release for Jelly Bean 4.2.2. Well, as we already know Samsung promised that it will bring the Android Jelly Bean 4.2.2 to their Samsung Galaxy S III phones immediately a while after they released their newly Samsung Galaxy S IV smartphone. The new update will have almost the same functions as Samsung Galaxy S IV except for those that are bound to the hardware options. SamMobile announced that they were expecting a Jelly Bean 4.2.2 release this summer and just after a while they released the I9300XXUFME7 – Android 4.2.2 Jelly Bean leaked firmware for the Galaxy S III so users can check the new upcoming functionalities. Here, we are posting the Youtube video explaining the features coming with the new Android update. And here is the list put by SamMobile. - Found more? Tell us about them in the comments below! Make sure you follow the directions carefully below. Let us know how it is. WARNINGS- This is a PRE-RELEASE firmware and is not officially released by Samsung. - This is just like any official firmware, it DOESN’T increase the binary counter nor changes the system state. - Start flash, sit back and wait a few minutes. Just as you, i am barely waiting for the new awesome Android update and their features. I have already checked Samsung Galaxy S IV and Jelly Bean 4.2.2 looks more robust and has a more elegant look to it. No wonder Samsung gets most of the Android fans getting their smartphones because they do care about updating their older devices with newer system updates. Thank you for taking your time to browse through our blog. We try to build as much rich content base as we can. We focus in modern technologies, computer science design and business. Do you feel like a noob, but you want to learn? This is where you become smart. Smartnoob provides high up to date quality content with topics from Information Technologies (IT) and eBusiness. We inform you about great updates that impact these modern fields. Also, we provide some tutorials and other tips and tricks in different areas of IT (Databases, Web Development, Programming). Smartnoob was formed by two students who would like to share their journey through studies in the world of Computer Science.